The Misericordia University Board of Trustees honored the philanthropy and leadership John C. Metz, Sr., and the late Frank M. Henry by presenting them with the Founders Medal during the annual Trustee Associates Gala at the Beaumont Inn. The Founders Medal is one of the highest honors bestowed by Misericordia, as the trustees award it only when merited. Trustee Marjorie Henry Marquart '85 and Scott E. Henry gratefully accepted the award on behalf of their family and father, who passed away in June. Mr. Metz, who retired from the board in June, accepted the award with his family by his side. Known for a lifetime of benevolence, Mr. Henry was the chairperson emeritus of Martz Group in Wilkes-Barre. He had guided and grown the business as CEO since 1964. Founded in 1908 by his grandfather, Frank Martz, Sr., in Plymouth, Pa., the Martz Group is a fifth generation, family-operated business that provides a variety of transportation services in Florida, Maryland, New Jersey, New York, Pennsylvania, Virginia and Washington, D.C., via the Gold Line, National Coach Works, First Class Coach and Martz Trailways companies. Mr. Henry used the same transformative approach with his motor coach companies to address the needs of his community. He invested his time, talent and treasure in quality of life issues that touched everyone. The Council for Advancement and Support of Education, for example, presented Mr. Henry with the Seymour Preston Award in 2000. The Frank M. & Dorothea Henry Cancer Center at Geisinger Wyoming Valley Medical Center has helped countless cancer patients and their loved ones since it opened in 1992 and expanded in 2009. The Misericordia University Board of Trustees honored the couple in 2014 by presenting them with the Trustee Associates Award for the their philanthropy, leadership and overall dedication to maintaining and strengthening the Catholic institution's mission of fostering intellectual curiosity, critical thinking, and respect for people in an environment where all are welcome. The Frank and Dorothea Henry Student Lounge bears the couple's name in recognition of their benevolence. The family's affinity with Luzerne County's first four-year college, though, began in 1980 with the late Dorothea Henry's appointment to the Board of Trustees, where she served until 1986. Ms. Marquart has been serving her alma mater as a trustee since 2013. Mr. Henry was the first major benefactor to commit his support to the "Now for Tomorrow" Campaign, the largest campaign in Misericordia's rich 94-year history. The campaign will support construction of the new $35 million Frank M. and Dorothea Henry Science Center and provide significant investment in the Annual Fund and endowment for additional scholarship opportunities for worthy students. Mr. Metz, executive chairperson of Metz Culinary Management, has been a stalwart member of the Misericordia community for many years, serving the institution since 1988 as a trustee and continuing in his new role as trustee emeritus. His foray into the restaurant and hospitality business began in 1967 when he founded Custom Management Corp., in Kingston, Pa. Today, the family-driven company is headquartered in Dallas, Pa., and has about 7,000 employees in 19 states, providing food management services to corporate, health care, school districts, and higher education clients. In addition, Metz Culinary Management owns and operates numerous franchises, including T.G.I. Friday's, Ruth's Chris Steak House, Wolfgang Puck Express, Lucky's Sporthouse and more. The success of the business is well documented. In April, Food Service Management magazine recognized the company as one of the top food service providers in the nation. Mr. Metz (1979) and his sons, John Metz, Jr., (2013), executive chef and co-founder of Marlow's Tavern and Sterling Spoon Culinary Management, and Jeff Metz (2017), president and CEO of Metz Culinary Management, each received the Silver Plate Award from the International Facility Management Association. A member of the Misericordia University Board of Trustees from 1988 to 2018, Mr. Metz and his colleagues oversaw rapid growth in overall enrollment, academic programs, campus facilities and prestige. Today, Misericordia ranks in the top tier of the Best Regional Universities – North category of U.S. News and World Report's 2018 edition of Best Colleges. The Princeton Review recognized MU as a 2019 Best Northeastern College and MONEY Magazine included the institution in its 2018-19 "Best Colleges" list. In 2002, Misericordia recognized Mr. Metz and his wife, Mary, for their philanthropy and leadership by awarding them the Trustee Associates Award. The award is given to friends of the University who have demonstrated outstanding dedication, service and generous support. The family's impact on the institution is obvious campus wide, as they supported the remodeling and renovation of the John and Mary Metz Dining Hall in the Banks Student Life Center and the addition of the InterMetzo Café in Sandy and Marlene Insalaco Hall. More recently, the University dedicated the John and Mary Metz Field House in 2012. The fieldhouse was named in honor of the couple and their three children, John Jr., Jeff and Maureen, in recognition of their exceptional dedication and support. Mr. Metz is also very active in his community and profession. He is a trustee of the National Restaurant Association's Education Foundation and a member of the state Restaurant Association. He previously served as the board director of the National Restaurant Association and member of the Board of Overseers for Harvard University. In 2013, the Boy Scouts of America presented him with the Distinguished Citizens Award and the Wilkes-Barre, Pa., Association for the Blind honored him with the Distinguished Community Service Award. The Greater Wilkes-Barre Chamber of Commerce awarded him the Distinguished Citizen Award in 2014. Hosting a successful golf fundraiser benefitting Special Olympics Georgia (SOGA) for 20 years is cause enough for Marlow’s Tavern and Sterling Spoon Culinary Management executive chef, CEO and co-founder John C. Metz to celebrate. The fact that his business partner Thomas H. DiGiorgio has agreed to serve as chair of the 2018 event makes the tournament even more momentous. DiGiorgio, who designed the first Marlow’s Tavern, has partnered with Metz on the successful restaurant venture for close to 23 years. Formerly president of DK Group, a Florida-based architectural development and contract firm, DiGiorgio currently heads up Sterling Hospitality Group’s real estate and development arm. DiGiorgio, who’s played in 16 of the 20 tourneys, is honored to be responsible for raising awareness and hopefully record-breaking funds for the organization that impacts so many lives. The 20th Annual Golf Classic will take place at TPC Sugarloaf on Oct. 15. Registration begins at 8:30 a.m. The event will be a fun-filled competition with contests, prizes and classic American tavern fare for all involved. The companies also aim to top $1 million in donations over the 20-year-old fundraiser. The tournament will be followed by a festive after-party complete with awards dinner and silent auction. Marlow’s Tavern has three Cobb County locations at 745 Chastain Road NW, Suite 1160 in Kennesaw; 1311 Johnson Ferry Road, Suite 208 in the Merchant's Walk Shopping Center in Marietta; and 2355 Cumberland Parkway, Suite 10 in Vinings. For more information about sponsoring the golf tournament, contact Susan Skolnick at 770-414- 9390 x111 or Susan.Skolnick@specialolympicsga.org. Atlanta, Ga. (November 2017) – Sterling Hospitality CEO, executive chef & co-founder John C. Metz has been named Alumni of the Year by The Penn State Hotel and Restaurant Society. 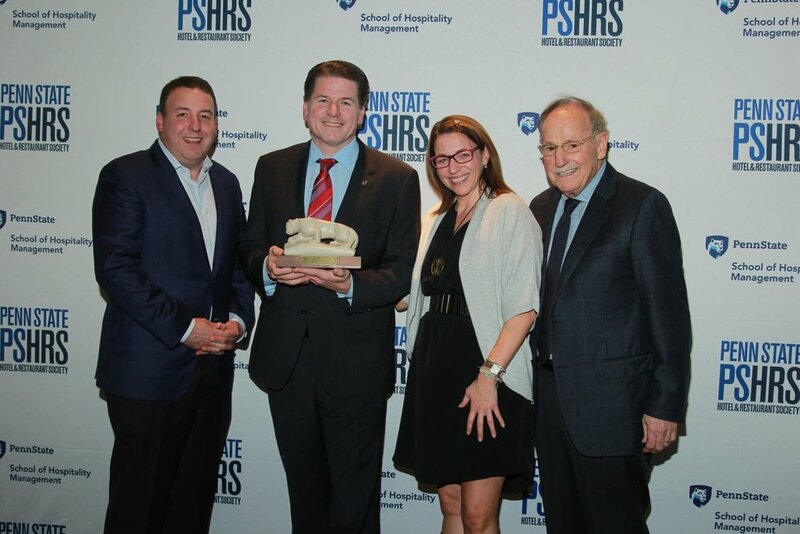 The Penn State Hotel and Restaurant Society and Penn State School of Hospitality Management honored Metz during the 2017 Alumni Awards Reception in conjunction with the school’s annual Alumni in the Classroom event. "Our alumni award recipients are great examples for our students who aspire to be future leaders in our dynamic industry," said Brian Black, director of hospitality industry relations. Under the umbrella of Sterling Hospitality, Metz created, and currently operates a number of original restaurant brands, including Marlow’s Tavern, an upscale neighborhood gathering place. He also co-founded and operates an upscale contract foodservice company, Sterling Spoon Culinary Management, which specializes in on-site restaurant management in the Georgia market. Metz began his career at some of the finest restaurants in New York City, including The 21 Club, Tribeca Grill, Park Avenue Café and Montrachet. He served as executive chef and executive director of research and development for Carlson Restaurants Worldwide, the franchisor for T.G.I. Friday’s and sister restaurants. (March 17, 2016) FM 50 2016: No. 39. Sterling Spoon Culinary Management Co. In 2015, Sterling Spoon introduced a catering/event strategy designed to be relevant throughout the year with a focus on full-service offerings for clients. Leveraging the company’s expertise in the restaurant business to create seasonal/holiday themed "new news" menus that incorporate the freshest available ingredients combined with a chef's flair, such as the American classic creations designed for the American Inspirations themed event. Revving up quick snacks and portable meals with great ingredients and world flavors can turn a c-store pit stop into something special. ATLANTA (August 07, 2014) – Kaffee Hopkins has partnered with Sterling Hospitality as the director of brand marketing for Aqua Blue, Marlow’s Tavern and Sterling Spoon Culinary Management. “These guys don’t believe in maintaining the status quo, so I’m thrilled to be in an environment that embraces new ideas,” says Hopkins, while eyeballing the cocktail specials at the Emory Point Marlow’s Tavern. “Mediocrity isn’t on the menu, and that suits me perfectly.” Kaffee’s advertising background made her a standout candidate for the job. She has served as vice president, group management supervisor at Grey Worldwide advertising agency. And comes most recently from Noffel Consulting, a firm she founded and grew. Her experience with such notable brands as Willy’s Mexicana Grill Applebee’s prove she knows how to help unique dining experiences stand out. “To say I’m excited to have Kaffee on our team would be an understatement,” says John C. Metz, co-founder, CEO and Executive Chef of Marlow’s Tavern and Sterling Spoon Culinary Management Co “She brings the kind of courage, guest insight, and fresh thinking we live by to a whole new level.” Hopkins spent the last few months immersing herself in the brand culture — from the corporate offices, into the kitchens, and out in front of the guests — to inspire engagement that is true to the brands she now represents, including Aqua Blue, Market Street Café, Sterling Spoon, and Marlow’s Tavern. Marlow’s Tavern was established in November 2004 with the opening of its first location in Alpharetta, Georgia, and has grown over the years, adding several Atlanta-area restaurants and locations in Orlando, Florida. In 2013, Nation’s Restaurant News named Marlow’s Tavern one of “NRN 50 Breakout Brands” for the year. The neighborhood restaurant concept chain is open forlunch and dinner daily, offering guests classic American tavern fare with an upscale twist. For moreinformation and tavern locations, visit marlowstavern.com. Sterling Spoon Culinary Management has been named one of Food Management Magazine’s Top 50 leading management companies in 2014 and 2013. The core mission of the company is to provide an extraordinary dining experience for every guest every time. Sterling Spoon strives to create a contemporary, inviting atmosphere that encourages repeat visits. Its cafes, restaurants and catering feature the kind of attention to detail found in a creative kitchen: casual and comfortable, yet delivering top-quality cuisine. Outstanding service, friendly attitudes and a relaxed, yet professional, environment define the Sterling Spoon experience. For more information, visit sterlingspoon.com. Sterling Spoon Culinary Management has been named one of the top 50 food management companies in the United States by Food Management magazine, a resource for onsite foodservice knowledge. Sterling Spoon was founded and operated by John C. Metz, Tom DiGiorgio and partner, chief operating officer/vice president of strategic development Robert J. Schmitz. The Sterling Spoon culinary team ensures that everything is prepared from scratch and that the menus change frequently, including daily and weekly specials. The company’s farm-to-fork purchasing practices and “a la minute” cooking methods allow for customized menus that feature fresh food from main plates like Atlantic salmon, USDA prime steaks and seared Ahi tuna to basic staples such as flatbreads, salads and sandwiches created from house-roasted turkey and more. The range of dining options is designed to suit both the employees and patrons of all of their clients. Sterling Spoon cafes also offer gluten and vegetarian options to accommodate special dietary needs, and the company’s signature Live Well initiative ensures menu items meet nationally accepted dietary guidelines in order to give guests guaranteed healthy and nutritious dining options. The culinary management company’s roster of clients also includes The Coca-Cola Company, NCR, Greenway Medical, Cousins Properties HQ, Global Payments and AFLAC. These corporations look to Sterling Spoon because of the food service provider’s homegrown approach to creating unique, customized menus for each venue. Atlanta (May 22, 2013) – John C. Metz, Jr., CEO, executive chef and co-founder of Sterling Hospitality, was named the Gold Plate Award winner by the International Foodservice Manufacturers Association (IFMA) on May 20 at Chicago’s historic Great Hall at Union Station. Metz, nominated by The Coca-Cola Company and Ecolab, was one of eight outstanding operator executives who were eligible for the award after receiving the IFMA Silver Plate award in February. He is the creator of several Atlanta-area and Florida brands and concepts, including Market Street Café, Aqua blue and Marlow’s Tavern. Metz represents the Independent Restaurants/Multi-Concept segment. It was a special night for the Metz family. Metz is carrying on his father’s legacy by being the second in his family to receive a Silver Plate award. His father, John C. Metz, Sr., received the award in 1979 in the Foodservice Management category. Now in its 59th year, IFMA’s Gold & Silver Plate Awards are considered the most coveted operator awards in the foodservice industry. The awards pay tribute to leading foodservice operators who have contributed to the advancement of their individual segments and the foodservice industry as a whole. In addition to Metz, the 2013 Silver Plate recipients include: Jay Silverstein (Business & Industry/Foodservice Management), Harald Herrmann (Chain Full Service/Multi-Concept), Don Fox (Chain Limited Service), Ken Toong (Colleges & Universities), Julia Bauscher (Elementary & Secondary Schools), Angelo Mojica (Health Care) and Jim Purdum (Hotels & Lodging). The Gold Plate award recipient was determined through secret ballot by a jury of past Silver Plate winners, national trade press editors, foodservice experts and the chairperson of the International Gold & Silver Plate Society. The Selection Jury was chaired by Nancy Kruse, President, The Kruse Company. The ballot was tallied by BDO USA, LLP and kept confidential until the announcement at the Gold & Silver Plate Celebration on May 20. Dave Thomas of Wendy’s (’79) and Steve Ells of Chipotle (’03) are among the renowned operators who have received IFMA Gold and Silver Plates over the years. The May 20 Gold & Silver Plate Celebration, which drew nearly 600 industry media, leaders and legends, was hosted by Gold Plate recipient (’84) Ted Balestreri, Chairman & CEO, Cannery Row Company. Sterling Spoon Brings Corporate Cafes to Midtown Atlanta's Promenade Building and to Greenway Medical Technologies' Headquarters in Carrolton. ATLANTA (March 2013) – Sterling Spoon Culinary Management (SSCM) Co-founders John C. Metz and Tom DiGiorgio, who are also creators of Atlanta concepts Market Street Café and Marlow’s Tavern, and Chief Operating Officer/Vice President of Strategic Development Robert J. Schmitz opened two new corporate cafés – Bistro 1230 at Promenade in Atlanta and Market Street Café at Greenway Medical Technologies’ corporate headquarters in Carrolton, Ga. – on December 17, 2012. “Each of these buildings represents new and exciting opportunities for Sterling Spoon Culinary Management,” says Schmitz. “Bistro 1230 at Promenade showcases the new look of our corporate cafes while continuing our excellent relationship with Cousins Properties, while Market Street Café at Greenway Medical exemplifies our ability to provide locally-owned and operated cafes to companies committed to partnering with only Atlanta-area based businesses. Greenway is a very fast growing company in the Georgia market that places a strong emphasis on these local partnerships, and we’re honored to satisfy their culinary management needs,” adds Schmitz. The Promenade building is a 38-story office tower located at 1230 Peachtree Street in Atlanta, Georgia. The café’s operating hours are 7 a.m. to 2:30 p.m. to offer breakfast and lunch to the building’s 3,000 employees. Culinary offerings boast a double toss station for salads, daily soup selections, pizza and paninis, a full grill and chef-inspired main plates. Market Street Express Catering is also available for larger functions. The décor of Bistro 1230 features…INSERT DÉCOR DETAILS. Greenway Medical Technologies, an industry-leading health IT software and services provider is located at 121 Greenway Boulevard in Carrolton, Georgia. The café’s operating hours are 7:30 a.m. to 5:30 p.m. to offer breakfast, lunch and dinner to the building’s 900 employees. Culinary offerings boast a double toss station for salads, daily “kettle cuisine” soup selections, pizza and sandwiches, a full grill and chef-inspired main plates as well as breakfast entrees. Market Street Express Catering is also offered. The décor of Market Street Café features…INSERT DÉCOR DETAILS. Market Street Café and Bistro 1230 offer guests a warm and inviting eatery that defies the common reputation of an office building cafeteria. Each location features lively colors and ambient lighting courtesy of DiGiorgio, who is also president of DK Group, a Florida-based architectural development and contract firm that has designed all of the restaurant group’s dining establishments. Both café locations’ menus offer a full line of classic café favorites made with the freshest products and quality ingredients and then served with a twist. The culinary experts at SSCM ensure that everything is prepared from scratch and that the menus change frequently and include daily specials. The company’s farm-to-fork purchasing practices and “a la minute” cooking methods allow for customized menus that feature fresh food from main entrees like hoisin marinated salmon, USDA prime steaks and crab stuffed tilapia to basic staples such as pizza, salads and sandwiches created from house cooked sirloin, turkey breast and more. The range of dining options is designed to suit both the boardroom and the mailroom at these office campuses. SSCM’s cafes also offer vegetarian options to accommodate special dietary needs, and the company’s signature Live Well initiative ensures menu items meet nationally accepted dietary guidelines in order to give guests guaranteed healthy and nutritious dining options. As a result, companies like Promenade and Greenway Medical are able to provide their employees with the tools to maintain a healthy lifestyle as an added amenity. The culinary management company’s roster of well-respected clients also includes The Coca-Cola Company, NCR, Greenway Medical, Kia Motor Cars, Cousins Properties HQ, Global Payments and AFLAC. These corporations look to SSCM because of the trusted food service provider’s homegrown approach to creating unique, customized menus for each venue. SSCM’s catering services also include formal catered events, casual meetings, refreshment services and eco-friendly trays. For more details on SSCM’s services, visit sterlingspoon.com. Sterling Spoon Culinary Management (SSCM) owns and operates public and private corporate cafés throughout Georgia such as Bistro 191 and Market Street Café. The company was founded by a restaurant management group led by restaurateur John C. Metz and designer Tom DiGiorgio. The restaurant management group is committed to high-quality cuisine and outstanding guest service and world class hospitality. This locally owned and operated restaurant management company places a major emphasis on community involvement has partnered with several non-profit organizations throughout the years, including Special Olympics Georgia, Share Our Strength and Atlanta Community Food Bank, as well as numerous local and neighborhood philanthropic partnerships in the communities they serve. Sterling Spoon Culinary Management possesses a food-first philosophy that combines talented chefs, dedicated employees, outstanding culinary and financial management to provide clients with extraordinary food and hospitality with an innovative retail approach. With a creative flair and a thoughtful Farm to Fork initiative, the chefs develop appetizing options that are wholesome, fresh and reasonably priced. Sterling Spoon Culinary Management is located at 4470 Chamblee Dunwoody Road, Suite 465; 678-395-7066. For more information, visit sterlingspoon.com. ATLANTA (February 2013) – The team behind such brands as Sterling Spoon Culinary Management (SSCM), Market Street Café, Aqua blue and Marlow’s Tavern has hired Tripp Harrison as a market partner at SSCM. The culinary management company’s roster of well-respected clients includes The Coca-Cola Company, NCR, Greenway Medical, Kia Motor Cars, Cousins Properties HQ, Global Payments and AFLAC. In 1993, Harrison began his career in fine dining at Oxford Steak Company in Oxford, MS. He quickly worked his way up to the executive chef position which inspired him to pursue a culinary degree at Johnson and Wales University in Charleston, SC to further develop his passion for high-quality food and service. While studying for his bachelor’s degree, Harrison was employed in various roles by Hospitality Management Group, Inc., operator of popular Charleston restaurants Magnolia’s, Blossom and Cypress Grill, and was eventually promoted to sous chef. Upon graduation, Harrison went to work for J. Alexander’s where he gained experience as a chef in the Birmingham, AL and Atlanta locations. In 2001, he began his on-site foodservice career in foodservice management, working as a regional chef before becoming a district manager. Sterling Spoon’s chef-driven food philosophy defies the common reputation of an office building cafeteria and offers guests a more comfortable environment when having lunch or grabbing a morning coffee. The cafés offer unique and flavorful fare and use only the freshest products and seasonal ingredients. SSCM treats these corporate cafes as on-site restaurants and creates tailored menus for each venue. on Monday, November 5. SSCM is also re-opened a corporate café at The Coca-Cola Company office campus in Alpharetta, Georgia, on Thursday, November 15.
at a great value,” he added. Market Street Café offers guests a warm and inviting eatery that defies the common reputation of an office building cafeteria. Each location features lively colors and ambient lighting courtesy of DiGiorgio, who is also president of DK Group, a Florida-based architectural development and contract firm that has designed all Sterling Hospitality dining establishments. Market Street Café’s menu offers a full line of classic café favorites made with the freshest products and quality ingredients and then served with a twist. The culinary experts at SSCM ensure that everything is prepared from scratch and that the menus change frequently and include daily specials. The company’s farm-to-fork purchasing practices and “a la minute” cooking methods allow for customized menus that feature fresh food from main entrees like hoisin marinated salmon, USDA prime steaks and crab stuffed tilapia to basic staples such as pizza, salads and sandwiches created from house cooked sirloin, turkey breast and more. The range of dining options is designed to suit both the boardroom and the mail room at these office campuses. SSCM’s cafes also offer vegetarian options to accommodate special dietary needs, and the company’s signature Live Well initiative ensures menu items meet nationally accepted dietary guidelines in order to give guests guaranteed healthy and nutritious dining options. As a result, companies like NCR and Coca-Cola are able to provide their employees with the tools to maintain a healthy lifestyle as an added amenity. The three cafés on the NCR campuses will serve 2,500 people. The cafe at Coca-Cola will serve 700 people. All of the cafes operate between the hours of 7 a.m. and 2 p.m. and are open to the public. The culinary management company’s roster of well-respected clients also includes Aflac, Avon, Cousins Properties HQ, Global Payments and BlueLinx, the country’s largest distributor of building products. These corporations look to SSCM because of the trusted food service provider’s homegrown approach to creating unique, customized menus for each venue. SSCM’s catering services also include formal catered events, casual meetings, refreshment services and eco-friendly trays. For more details on SSCM’s services, visit www.sterlingspoon.com. ATLANTA (July 2012) – Sterling Spoon Culinary Management (SSCM), a leader in on-site culinary cafes in the Southeast, is now operating four cafes at Aflac’s corporate headquarters in Columbus, Georgia, and three cafes within the Sanctuary Park office development in Alpharetta, Georgia. SSCM Co-Founders John C. Metz and Tom DiGiorgio, who are also creators of Atlanta concepts Market Street Café, Aqua blue and Marlow’s Tavern, and Chief Operating Officer/Vice President of Strategic Development Robert Schmitz have created a locally owned and operated company focused on chef-driven food and world class hospitality for its guest and clients to enjoy. SSCM’s mission is to deliver industry-leading food, service and hospitality, which translates to a casual café atmosphere featuring relaxed yet professional service and a daily rotation of fresh, nutritious, safe and delicious house-made foods. These partnerships with Aflac and Sanctuary Park enable SSCM to provide customized on-site dining options for employees of leading corporations in the state of Georgia and throughout the Southeast. The four cafes on the Aflac campus opened on May 7, 2012, and serve 4,300 people. The three cafes at Sanctuary Park are scheduled to open on July 9, 2012, and will serve 5,000 people. Sanctuary Park’s cafes will also be open to the public in addition to the office park employees. All of the cafes operate between the hours of 7 a.m. and 2 p.m.
By bringing a unique mix of culinary expertise and innovative menus to the corporate dining experience, SSCM defies the common perception of office building cafeterias. The culinary experts behind SSCM’s corporate cafes ensure that everything is cooked on site from scratch and that the menus change frequently and include daily specials. Local farm-to-fork purchasing practices and “a la minute” cooking methods allow for customized menus that feature fresh food from main entrees like Hoisin marinated salmon, USDA prime steaks, and crab stuffed tilapia to basic staples such as pizza, salads and sandwiches created from house cooked sirloin, turkey breast and more. The range of dining options is designed to suit both the board room and the mail room at these office parks. SSCM’s cafes also offer vegetarian options to accommodate special dietary needs, and the company’s signature HEALTHchecks initiative ensures menu items meet nationally accepted dietary guidelines in order to give guests guaranteed healthy and nutritious dining options. As a result, companies like Aflac and other SSCM clients are able to provide their employees with the tools to maintain a healthy lifestyle as an added amenity. The culinary management company’s roster of well-respected clients also includes The Coca-Cola Company, Avon, Cousins Properties HQ, Global Payments and BlueLinx, the country’s largest distributor of building products. These corporations look to SSCM because of the trusted food service provider’s homegrown approach to creating unique, customized menus for each venue. Sterling Hospitality, the restaurant management company behind Aqua blue, Marlow's Tavern and Sterling Spoon Culinary Management, raised $7,875 for the Atlanta Community Food Bank (ACFB). Marlow's Tavern locations raised the funds through the restaurants' recent Bayou 'n Bourbon special. During the six-week long promotion, guests who dined at any of the six locations were given the option to add a donation to their dinner bill for the ACFB. Marlow's Tavern thanked guests who donated $15 or more. All six locations of Marlow's Tavern were able to raise $6,695. Also, Aqua blue's Hunger Walk/Run team raised $1,180 to benefit ACFB. "We truly believe in and support the efforts of the Atlanta Community Food Bank." said John Metz, co-founder of Sterling Hospitality. Market Street Café has opened in Buckhead. The café, in the Prominance Building at 3475 Piedmont Road, is in the 5,434 square feet, once occupied by Roy's Hawaiian Fusion Cuisine. The café "will give office workers something different from the every day brown-bag lunch," said John C. Metz Jr., restaurateur and executive chef, who opened the café withTom DiGiorgio and Robert Schmitz of Sterling Spoon Culinary Management. Sterling Spoon Culinary Management, owned by Sterling Hospitality, operates several public and private corporate cafés throughout the state. Bob Garret is the general manager and chef de cuisine at Market Street Café, which also has private-event space for the office building. Restaurateurs John C. Metz and Tom DiGiorgio the co-founders and owners of Sterling Hospitality and Aqua blue Restaurant & Bar, are pleased to announce a new extension of the company: Aqua blue Catered Events. This on- and off-premise catering business has been created to fill a void among Atlanta area venues that don’t have their own kitchens and to bring the same delicious food and impeccable service for which Sterling Hospitality restaurants are known. “Aqua blue is currently celebrating its tenth year in business, and we feel as though the company’s strong history and the vast experience among our staff members have given us the opportunity to satisfy a new segment of the Atlanta-area market,” says Metz. With 14 years of experience in Atlanta and 10 restaurant locations, Sterling Hospitality is very involved in the local hospitality community. At Aqua blue Catered Events, Executive Chef John Metz, Chief Operating Officer Robert Schmitz and Chef de Cuisine Kien Sam have more than 100 years of combined experience in the culinary field and have paired with a team of expert event coordinators to turn ideal events into realities. The company's devoted event planners have gained access to dozens of spectacular locations around Atlanta from which guests can choose to host their events, such as Mason Murer Fine Art, Callanwolde Fine Arts Center, 200 Peachtree, The Biltmore Ballrooms, The Wimbish House and The Garden at Great Oaks in Roswell. Aqua blue Restaurant & Bar serves as another event venue with banquet facilities that hold up to 300 guests. The restaurant’s patio holds large parties and features new furniture, colorful landscaping and heaters for the colder months, while the restaurant’s newly redesigned wine room is perfect for intimate gatherings of up to 40 people. Sterling Spoon Culinary Management’s newly opened Market Street Café in Buckhead is also one of Aqua blue Catered Event’s premier sites for off-premise events. Aqua blue Catered Events’ menu options include allof the fresh and seasonal foods served at Sterling Hospitality restaurants (Aqua blue and Marlow’s Tavern), as well as items that are part of the company’s Farm to Fork initiative to serve dishes that are reasonably priced yet still fresh and wholesome. Sterling Hospitality has partnered with Royal Food Service to purchase food products from local Georgia farms in order to support the local economy and reduce the company’s carbon footprint. Aqua blue specializes in the freshest seafood, blue ribbon sushi, a selection of prime-cut steaks and several Asian-inspired menu options, while Marlow’s Tavern offers gourmet American tavern fare. With a longstanding culture of chef driven food, Aqua blue also has the ability to create and customize any new menu options or needs that guests may have. Examples of butlered hors d’oeuvres include firecracker spicy tempura shrimp with sweet chili sauce and spicy remoulade; duck and sweet potato fritter finished with a blueberry ketchup; and carved lobster tail with thyme lemonette served with a vanilla grapefruit butter in an Asian spoon. Stationary hors d’oeuvres include items like Mediterranean antipasto, lamb meatballs with tahini lemon sauce, assorted flatbreads, a raw bar and an artisan cheese display. The broad range of options for chef-attended action stations gives clients the opportunity to achieve a themed meal, from Italian pasta to Asian stir fry to Southern home cooking. Dinner selections can be served as a plated meal or buffet style and include a salad, entrée, two side dishes and a dessert. Salad selections feature choices such as Georgia peaches and St. Andre cheese atop watercress with a fig vinaigrette and fresh ginger salad with crisp romaine, tomatoes, carrots and sweet ginger dressing. Entrée options include dishes like roasted Peking duck with sweet sesame soy sauce; center cut veal chop with gorgonzola cream sauce; blackened halibut topped with lobster sauce; and shrimp and grits with roasted tomato beurre blanc. Side selections such as spaghetti squash, sweet potato gratin, baby bok choy, soft polenta with shaved cheddar cheese and scallions, and sautéed button mushrooms round out the meal. For a sweet finale, dessert favorites such as chocolate layer cake, apple crumb cake, red velvet cake, tres leches coconut cake, fudge pecan caramel cake, a mousse bar and a selection of petit fours are offered. Sabrina Rosenberg serves as the director of sales and events and can be reached at 410-404-0322 or srosenberg@sterlingspoon.com to discuss making upcoming events memorable ones with Aqua blue Catered Events. Rosenberg worked for several high-end hotels and restaurants before her arrival at Aqua blue in January of 2011, including the Grand Hyatt Philadelphia, the Hyatt Regency Baltimore, and Il Mulino in Atlanta, Georgia. Aqua blue is located at 1564 Holcomb Bridge Road and opens daily for dinner at 4 p.m. For more information, call 770-643-8886 or visit www.aquablueatl.com. For more information on Aqua blue Catered Events, visit www.aquabluecatering.com. ATLANTA (August 2010 | Atlanta Business Chronicle) – Sterling Spoon is growing its restaurant business in office environments. Sterling Spoon Culinary Management recently acquired two new clients, Avon, a leading global beauty company, and BlueLinx, the country's largest distributor of building products.